They say that laughter is the best medicine, so dose yourself up with a night spent in the presence of some of the finest comedians, coming to a town near you. There's no man that knows a pun quite like Stewart Francis. He's become the master of the one-liners and has enjoyed worldwide success with his quick wit and hilarious punch lines. Having extended his UK tour into 2019, Into The Punset will in fact be his last ever tour, as he retires from the road next year. Make sure you see the man live before we're left with a pun-shaped hole in our hearts. Award-winning Australian comedian, actor and composer, Tim Minchin returns to the live stage for his first UK tour dates in eight years. Having won countless awards for his musical compositions, his new show will include plenty of new songs, old songs and some hilarious anecdotes from his individualistic repertoire. 2020 may seem like a lifetime away, but it’ll come around quick and it’s always nice to have something to look forward to, isn’t it? The man with the laugh, Jimmy Carr is back with a brand new show about all kinds of terrible things, jokes that’ll probably offend you, but that’ll have you crying with laughter at the same time. So, see you in 2020? You may recognise Daniel Sloss from his Netflix specials, but he’s been dominating the live comedy circuit for over 10 years. The Scottish star has won over audiences worldwide and continues to do so with his new show, X. Renowned for his dark, but incredibly witty and smart humour, this isn’t one for the easily offended, but definitely for those who enjoy a good belly laugh from time to time. Five years on from his last live comedy masterpiece and Eddie Izzard is back with Wunderbar, a delicious insight into his surreal and fantastic world. Having made history with previous stand-ups, as well as being an avid political speaker and writer, Eddie Izzard has become a staple in England’s hearts and continues to amaze with his theatrical and completely and utterly fabulous performances. Romesh Ranganathan is firm TV comedy favourite and following on from the hugely successful, ‘Misadventures Of Romesh Ranganathan’ and ‘Judge Romesh’, he’s now back with a brand new live show, The Cynic’s Mixtape. His most brutal and honest show yet, he’ll be discussing all the things he finds unacceptable, why saving the environment is a scam and other such suspicions. There’s more to Rob Beckett than his teeth you know. The comedian has scored himself an impressive list of TV appearances across the years, including comedy favourites, 8 Out Of 10 Cats, Mock The Week and Would I Lie To You?, but now he’s returning to stages with a brand new stand-up show to fill you all in on what’s been going on in the life of the mouth of the south. The name of James Acaster’s new show is very self-descriptive. He ate a cold lasagne, hated himself for it and claims 1999 was the best year of his life. That’s just an insight into the whimsical things that fill his mind and you can hear similar stories when he takes the show on the road. One of the most original voices in comedy, he’s quickly becoming one of the nation’s favourite performers, so don’t miss your chance to experience his ridiculousness live. Patton Oswalt is a good friend of the big screen, with notable roles in sitcoms, animated movies and even music videos (watch Weezer’s ‘I Love The USA’ to see what we mean). But it’s on stage doing stand-up comedy where he truly shines and fortunately he’s had a career that provides plenty of stories along the way. 2019 sees Reginald D Hunter celebrating his twentieth year as a comedian living and performing in the UK by setting out on a huge tour across the nation. Armed with a brand new show full of brutally honest material that’ll have you questioning your opinions and laughing until your face hurts, this could well be his finest work yet. Roy Chubby Brown is a legend amongst comics. An inspiration for writers, actors and performers worldwide, his unique style of comedy will either deeply offend you or have you chortling for hours, there’s no in between. Then again, that’s why he’s become one of the greatest stand-up performers in history, so we wouldn’t have it any other way. 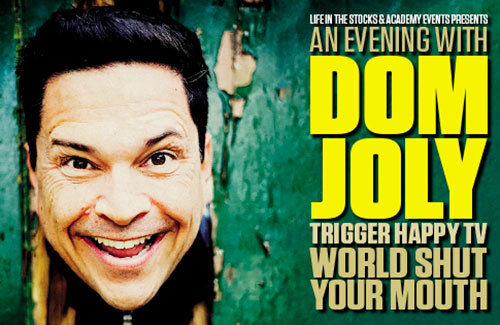 Still to this day you can catch people saying phrases from the worldwide hit series, Trigger Happy TV, the hidden camera, practical joke show brought to life by Dom Joly. The comedian and journalist was catapulted into the spotlight with the show and has since gone on to write and record further TV productions. Sitting down with Matt Stocks for a Q&A all about his work, this is your chance to get inside the mind of one of Britain’s best comedians. Bianca Del Rio returns to O2 Apollo Manchester with her brand new comedy show, It’s Jester Joke, which is probably the most ambitious solo drag show in history. Guaranteed to have you in stitches as she tells tales of her travels and the outrageous life that she leads, as well as expressing her views on social media and politics, this is your chance to witness one of the biggest drag superstars in the world today.